I’ve been blogging a lot lately about this Ontario Spring Classic. The 2017 version didn’t disappoint as over 300 riders entered the fifth edition of this event. 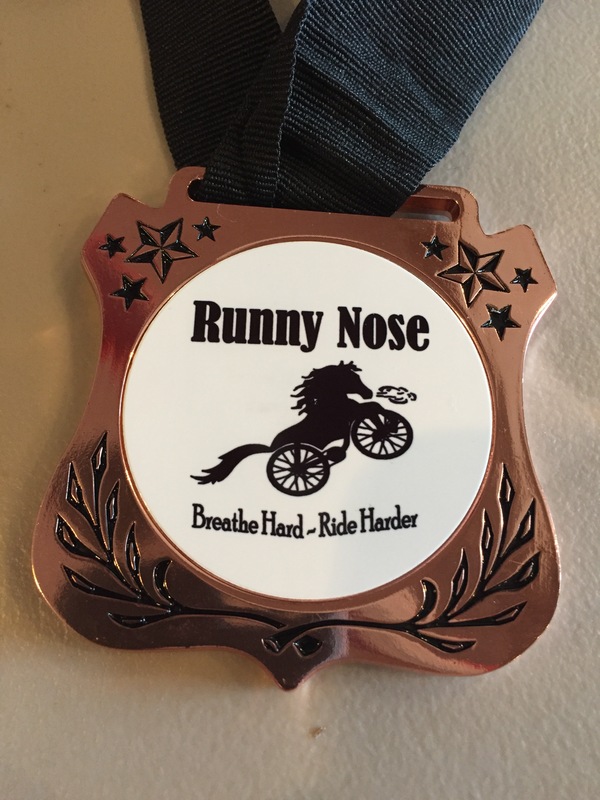 In past years, there has been a wide variety of challenges in the Steaming Nostril and the shorter Runny Nose: slow, slushy trails, minus 20C wintery conditions, epic mud, strong winds… this race has had it all! This year, the forecast called for temperatures as high as 18C and the spring has been drier than normal so there was a chance we would have ideal conditions. In some ways, we did! Dirt roads were dry. The Longest Kilometre was a lot drier than last year. And it was warm enough to wear shorts! The wind, however, decided to step in. This race differs from another Ontario Spring Classic – Paris to Ancaster, in that it’s a big loop, so sometimes there will be a headwind, sometimes a cross wind, and some (rare) times, a tail wind. On race day, the wind was strong from the south west. The course headed north (tail wind), then west (head/cross wind) then some N and W, followed by south (headwind) then back east (cross wind). 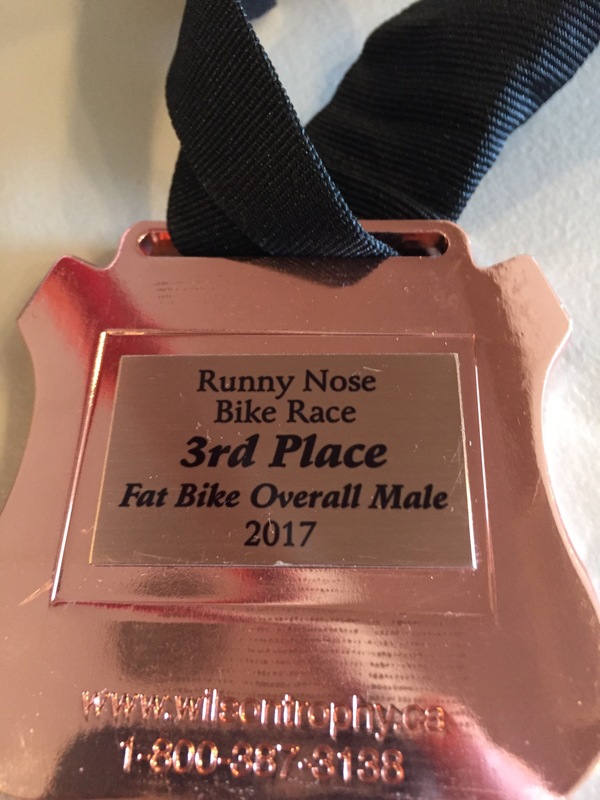 I decided to enter the Runny Nose on my fat bike this year. And it became my Ride #44 of my 50 rides in my 50th year for several reasons that I’ll allude to in a moment. 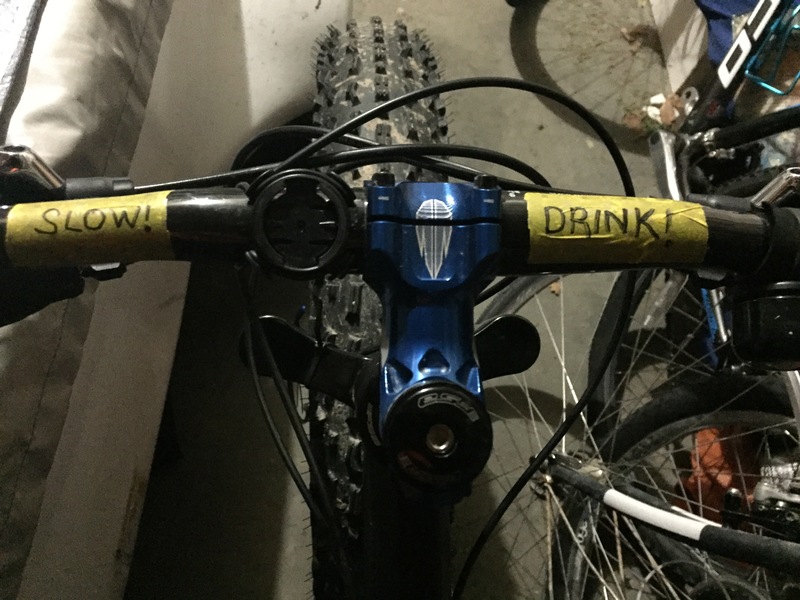 My friend Shelly, who wasn’t in the race, gave me the advice to write SLOW and DRINK on my bike to remind me to take it easy in my recovery and to keep hydrated. Whenever I looked down and saw these reminders, I backed off a bit, knowing I’d pay for it later if I rode too hard. Less than 10km into the 45 km distance I was already regretting my decision to ride the fat bike. I’d forgotten how much work it is for me to ride my fat bike when trying to keep up with others on cyclocross or even mountain bikes. The race started at the Waterloo Rod and Gun Club near St. Jacobs. There was a quick grass climb before we headed out on the road towards the Mill Race trail in St. Jacobs. I started well but quickly realized I was going too fast and I’d have to slow down. Two fat bikers were ahead of me and there was no way I’d keep up with them so I slowed down. My friend Scott caught up to me on King St and we rode together for a while until I couldn’t keep up (Scott was also on a fat bike). Another fat biker, Christina, from the Pinoy Pedal Pushers also caught me and we rode together for a while. Scott was always in sight, about 30 seconds up the road. About 20 km into the race (an hour or so), an amazing thing happened. The longer-course riders started 30 minutes AFTER us but the lead riders caught us just before the trail trail. This means they covered 20 km in HALF the time it took us. Simply amazing! We turned south into the headwind and by this time, Scott, Christina and I were riding together. Before the turn on Boomer, there was a rest stop where I had to tighten my crank which was coming loose. I rode most of Boomer alone before turning onto Kressler where I had a brief tailwind. This lead to the Longest Kilometre which was a lot drier than last year. The downhill was very rideable. The grass was as well. There was even a tent before the climb that was offering shots of maple syrup (I’m convinced that this is what got me to the finish!). The uphill was steep but walkable compared to last year (This year there were two options to get back up the hill. The steep option, and the not-so-steep option. The steep option didn’t look as muddy as last year, so I rode it. It was the right choice. I tried to bribe people to carry my bike to the top. I got as high as $30, but had no takers!). On this uphill, another amazing thing happened. The top riders passed me AGAIN! This means: they started 30 minutes after me, rode nearly 20 km longer and still finished ahead of me! My friend Gaelen was in third overall with the leaders in sight (he ended up in third with an average speed over 35 km/h). Scott and I reached the top of the climb together and rode a while together. I was feeling pretty good so I left Scott in the final gravel roads and finished alone. 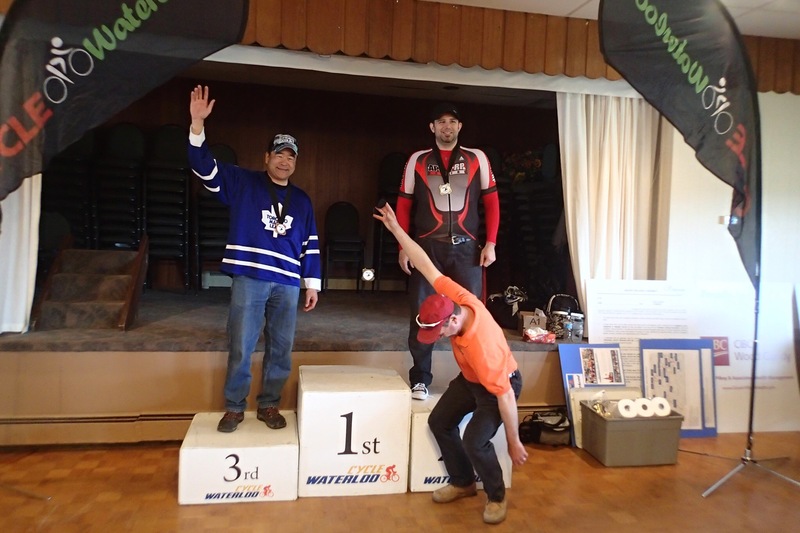 I soon found out that I finished in third in the short course fat bike category! 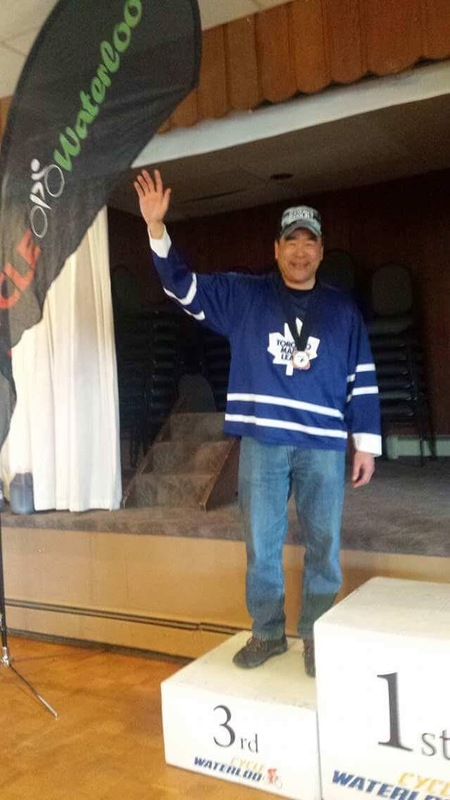 And of course I was wearing my Leafs jersey (after finally making the playoffs… we don’t get to celebrate very often!). If you look closely, you’ll see that I’m wearing a #TeamColin hat! A gift from Colin that I’ll wear as proudly as my medal, which, by the way, is my first ever individual cycling medal! I have a handful of medals from relay/team events, but this was a first! The first place rider didn’t show up so race organizer Malcolm held his medal in place! 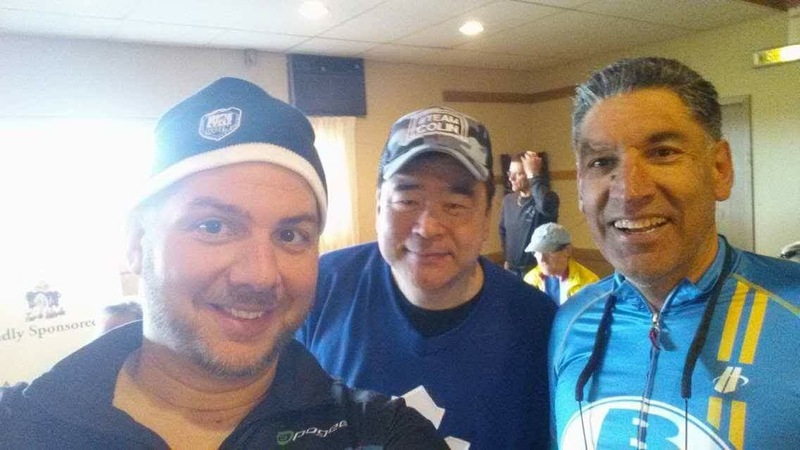 Speaking of Malcolm, he and Blake are Cycle Waterloo and they organize amazing cycling events. This year they also have the KW Classic plus two crits. I think everyone who rode today will agree that the Steaming Nostril was a fantastic event, well organized with a great meal and prizes! And thanks to my many friends (new and ummm … old) who rode and/or cheered today. At these events, it’s all about the people, and I love the cycling community at these events. Congrats Steve! I didn’t know you hit the podium! Congrats Steve. Well done and your game plan payed off. Congratulations Steve, thanks for the post ride report. Sounds like a lot of fun and great accomplishment bud!